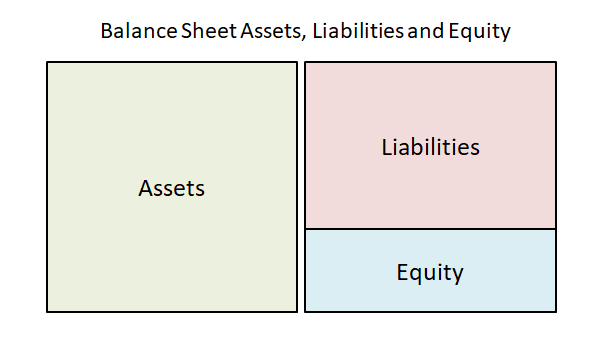 There are three elements to a balance sheet, assets liabilities and equity. The three elements together must satisfy the accounting equation for the balance sheet to balance. An asset is a resource the business has purchased in the past from which future economic benefits are expected to flow. They are items which a business owns and has control of such as inventory or motor vehicles, but can also include costs which have been paid in advance such as rent, which will be treated as an expense in a future income statement. For example, if a business purchases a piece of machinery for use in its factory, then the machinery will be in use over its useful life to manufacture products, and therefore has a future economic benefit to the business. In contrast to this, if a business purchases items which have no future economic benefit, then this cost will be recorded as an expense. For example, if the business has a wage cost for hours worked by factory employees, then this cost has no future benefit (the hours paid for have already been worked) and the cost is treated as an expense. In addition, costs which are immaterial may also be treated as expenses even though they might have a future benefit. For example, a box of pens has a future value, but the cost is immaterial and the time and effort needed to monitor the inventory of pens is such that it would be more efficient to record the cost as a stationery expense in the current accounting period. It should be noted that the term assets in accounting is much narrower than that used in the general sense. Not all assets have a cost, for example employees, customer lists or the inherent brand value of a business are in the general sense assets, but since they have no cost, they are not regarded as assets in accounting and are not included on the balance sheet of the business. In the accounting records, asset accounts normally have a debit balance which means they are increased by debit entries and decreased by credit entries. Assets are shown on the balance sheet of the business as either current assets or non-current assets. Assets can classified as current assets is they are cash or cash equivalents, or when they are held primarily for the purpose of trade or they are realized or used as part of the normal operating cycle. Current assets includes assets such as inventory, accounts receivable, and cash. Other assets which are not part of the normal operating cycle, are classified as current assets if they expect to be realized within twelve months of the balance sheet date. Current assets are shown in the balance sheet at the lower of cost or net realizable value. Non-current assets are all other assets not classified as a current assets. They include property, plant and equipment, motor vehicles, buildings, and fixtures and fittings. Non-current assets are for use long term within the business and are not bought primarily to be sold.They are sometimes referred to as long term assets or fixed assets. Non-current assets are included in the balance sheet at their original cost less accumulated depreciation. A liability is an obligation to pay a third party incurred by a business as part of its trading operations. For example, when a business buys goods from a supplier on credit, the business has a liability to the supplier to pay for the goods. The settling of the liability will result in an outflow of resources. A liability can also arise from the receipt of revenue in advance. Liabilities are beyond the control of the business. A liability is shown on the credit side of the balance sheet of a business and is part of the fundamental accounting equation. Liabilities can be classified in the balance sheet as current liabilities or non-current liabilities. Liabilities can classified as current liabilities when they are held primarily for the purpose of trade or they are settled as part of the normal operating cycle. This includes liabilities such as trade accounts payable, accrued expenses, interest payable, wages payable and deferred revenue. Other liabilities which are not part of the normal operating cycle, are classified as current liabilities if they have to be settled within twelve months of the balance sheet date. These will include liabilities such as bank overdrafts and the current portion of bank loans, dividends payable, and income taxes. Non-current liabilities are all other liabilities not classified as a current liabilities. They include long term bank loans, notes payable, and bonds payable. Non-current liabilities are sometimes referred to as long term liabilities. The differences between assets and liabilities discussed above are summarized in the table below. Equity is the amount due to the owners of the business, this includes the capital invested by them and any retained earnings the business has. For a company the term owners equity is replaced by the term stockholders equity. Equity can also be viewed as the net worth of business which is the difference between its assets and liabilities. This can be seen by rearranging the basic accounting equation. It is important to understand that the equity shown in the balance sheet does not reflect the market value of the equity but is simply the difference between the assets of the business at cost and the liabilities.